Happy Tuesday everyone! Thank you for stopping by to witness the book trailer premiere and amazing, international contest hosted by debut YA author, Laura Ellen. Check out the contest details below after learning a bit about her upcoming book (available for pre-order in Kindle/Nook and Hardcover formats!) and viewing BLIND SPOT'S trailer. 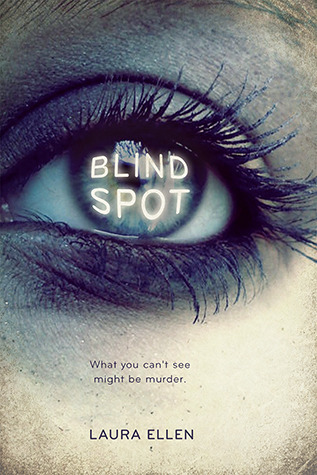 The trailer for Blind Spot was produced by Vania Stoyanova at VLC Productions. Laura Ellen's 14-year-old son James composed and performed the music for the trailer with Steve 'Oz' Osburn. It was recorded in Muruga Booker's Sage Court Studios. In Blind Spot, Roz has a visual impairment that makes her feel insecure. As a result, she become so obsessed with proving she is 'normal' that she loses sight of everything else- including clues to a murder. Share it and you could win a signed hardcover of Blind Spot and the chance to have your 'blind spot' story posted on October 26th during Laura Ellen’s blog tour. Some of your favorite authors will be sharing their stories too! To enter go to Laura Ellen’s website www.lauraellenbooks.com and fill out the contest form any time between October 2nd and midnight EST October 16, 2012. Sounds like such a fun contest so if you have one, make sure you share your 'blind spot' story with Laura! Also, stay tuned for BLIND SPOT'S book trailer premiere! Don't forget to add the novel on Goodreads!